Trenitalia is the main train operator in Italy. A subsidiary of Ferrovie dello Stato Italiane, Trenitalia offers national rail transport in Italy and international connections. The company operates both regional and long-distance trains. Regional trains travel within an Italian region or between neighboring Italian regions, connecting the country's biggest cities to towns and countryside, with a service which may be defined capillary. 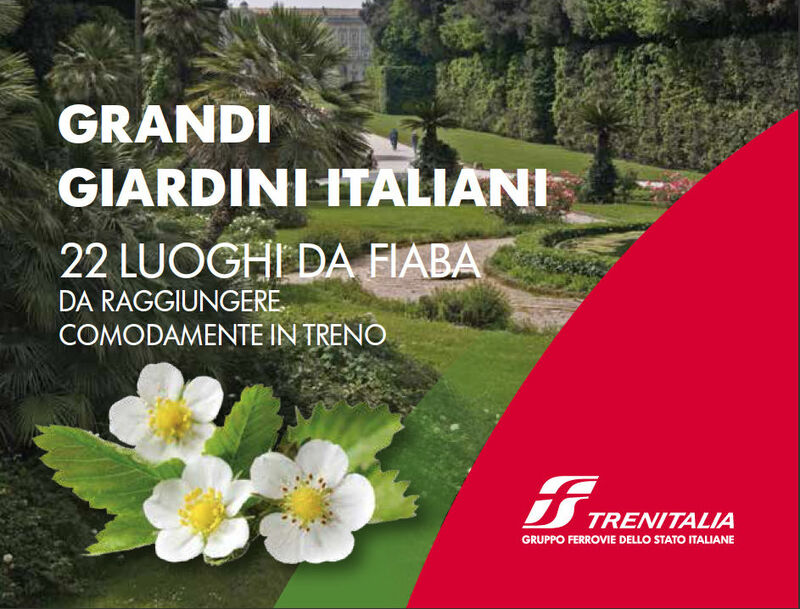 The partnership between Grandi Giardini Italiani and Trenitalia aims to enhance the botanical and naturalistic heritage of the Belpaese, with gardens accessible by the most environmentally friendly, convenient, safe means of transport and, thanks also to the arrival of new trains, increasingly comfortable. Of the 137 gardens of the network, located in 15 regions, with over 8 million visitors a year,22 are easily reachable by regional trains and within 2 km from the closest railway station: in Piedmont Isola Bella and Parco Pallavicino from the Stresa station (VB); in Liguria Villa Ormond from Sanremo (IM), Villa Grock from Imperia, the Giardini di Villa della Pergola from Alassio (SV), Villa Durazzo Pallavicini from Genoa Pegli and Villa Durazzo from S. Margherita-Portofino; in Lombardy Villa Necchi Campiglio and the Orto Botanico di Brera from Central Milan station; in Trentino Alto Adige the Parco delle Terme di Levico in Levico (TN); in Veneto Giardino Giusti da Verona Porta Vescovo and the Orto Botanico di Padova; in Tuscany Giardino Bardini from Florence Santa Maria Novella; in the Lazio Giardino di Palazzo Colonna from Roma Termini, Giardini Vaticani from Rome S. Pietro, Villa d'Este from Tivoli (RM) and Ville Pontificie from Castel Gandolfo (RM); in Campania the Reggia di Caserta from Caserta; in Sicily the Orto Botanico di Palermo from Central station, the Orto Botanico di Catania from Central Catania and the Giardino di Casa Pennisi from Acireale (CT). The 21 Gardens reachable by train are the focal point of Trenitalia's third monotematic travel book. The book contains historical notes, main curiosities, information on opening hours of the gardens and useful information regarding the railway line, giving you all the information you need to reach your destination. The project aims to inform customers of the many wonderful places that can be discovered and enjoyed by train, thus supporting them in terms of sustainable and convenient mobility, forgetting the stress of the car. All of Trenitalia's customers travelling by regional service will receive a discount of € 3.50 on the online purchase of the Grandi Giardini Italiani Guide, containing all necessary information to organize a trip to one of the wonderful local parks, purchasable for € 10,50 instead of € 14,00 shipping costs to Italy included. To take advantage of the discount simply send a scanned copy of your regional travel ticket to the commerciale@grandigiardini.it.